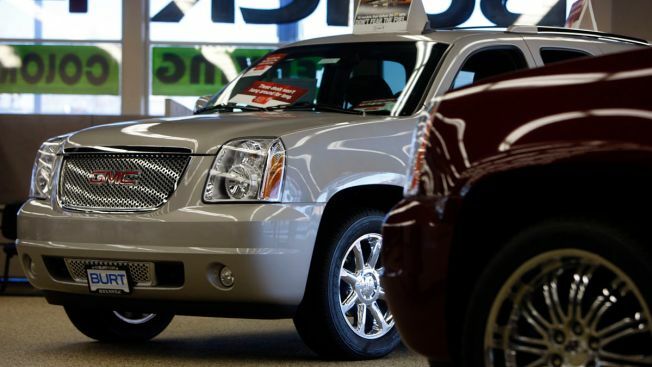 File Photo: Unsold 2008 Denali sports-utility vehicles sit on the showroom floor at a GMC Truck dealership in Littleton, Colo.
Automakers, car dealers and parts manufacturers have gone into high gear in a bid to derail the threat of new tariffs on foreign-made cars and car parts. The tariffs, they warn, could backfire, raising prices for U.S. consumers and sending the domestic automotive market into a tailspin, NBC News reported. The latest wave of concern was triggered by the Commerce Department’s confirmation that it had delivered on Sunday a long-awaited report to President Donald Trump that looked at whether foreign autos and auto parts pose a threat to national security. Trump has indicated that if the report backs up that conclusion, he may impose tariffs expected to run as high as 20 to 25 percent. While Detroit’s Big Three automakers have raised concerns about foreign-made vehicles over the past several decades, “not a single company in the domestic auto industry requested this investigation,” the Motor and Equipment Manufacturers Association, a trade group representing a broad alliance of automotive companies, said in a statement.